By weight, honey bees may be the state's most valuable export. Hawaiians Love Spam. Hawaii consumes more Spam than any other state, in total, 7 million cans a year. Hawaii is perhaps the most widely regarded state in the entire U.S. In terms of scenery and tourism. It is also the last state to be inducted into the country on August 21st, 1959, and is the only state to be entirely consist of islands. Hawaii is located in the northern region of the Polynesia island group. The scenery throughout the state is diverse and very natural and thrives in the warm tropical climate in the region. There are many scenic public peaches and surrounding oceans along with still active volcanoes. These features make the state a hugely popular tourist destination and attracts surfers, biologists, volcanologist's from across the globe. Hawaii is thriving with its own native culture but also has strong Asian and North American influence due to its location in the Pacific Ocean. The capital of the state is Honolulu and is located on the island of O'ahu. Hawaii includes most of the Hawaiian Island Chain which is filled with several hundreds of various islands which span over 1,500 miles. There are eight main islands, Kaua'i, Ni'ihau, O'ahu, Moloka'i, Kaho'olawe, Lana'i, Maui, and Hawai'i. 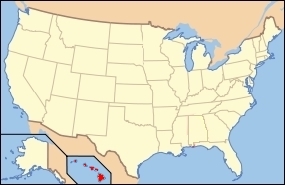 The biggest of the islands is referred to as “The Big Island” so as to not confuse its name with the name of the state. Hawaii is ranked as the 8th least extensive state and is ranked 11th in terms of overall population, and is the 13th ranked in terms of population density. There is roughly 750 miles of coastal perimeter in Hawaii, which ranks it fourth in this category in the United States. The entire state which includes all of the islands making it up constitute almost 11,000 square miles of land area. Hawaii's major industries include tourism, and agriculture; primarily pineapples, bananas, macadamia nuts and taro. Hawaii has two major rivers which are the Wailuku river and the Anahulu river. The highest point of elevation in the state is Mauna Kea which sits 13,796 feet above the sea level. 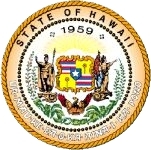 The state is nicknames the “Aloha State” and their motto is “The life of the land is perpetuated in righteousness”. The state bird is the Nene (Hawaiian Goose) and the state fish is the reef triggerfish. The state flower is the Hibiscus and the state tree is the Kukui tree. Hawaii will continue to draw the attention of tourists across the globe thanks to its breathtaking scenery and stunning beaches. It is definitely at the top of the charts amongst the other 50 states in terms of scenery and tourism, and people looking to visit the state will surely not be disappointed – as many visitors seem to return quite frequently.